As an expert, healer or coach, you can build a respectable, lucrative empire with integrity by creating an authentic personal brand and leveraging the media to go global. I’ll show you how being your authentic self is naturally magnetic, hugely profitable and the most sustainable model for your success. In this Masterclass I explain the 5 stages of business growth you’ll experience on the path to becoming a global luminary, a shining star who’s light is seen and who’s warmth is felt by millions around the world. We begin with your VISION. Ideally, take some time to meditate or get comfortable and quiet so that you can imagine yourself fully expressing your gifts and talents, with the greatest ease, flow and joy. See yourself helping others, being rewarded for your contribution to their lives, living abundantly and feeling fulfilled. The vision creates the blueprint, and sets the stage for how you’ll show up in the world. And it’s ok to create a stretch vision, that is to imagine yourself beyond where you are currently, imagine the YOU that you desire to become, expressing yourself in the way that you are destined to. In the POSITION stage, you’re goal is to position yourself so that you’re found, recognized and seen as an expert or authority in your field. This involves raising your profile so that people appreciate the value of working with you. In the PRESENT stage your intention is to establish your credibility as an expert and elevate your prestige. You must be true to you! If you’re shy, an introvert or afraid to seem like you’re bragging, then let your platform brag for you! You can publish a book for increased perceived value & prestige and let the words tell your story. It makes you more RELATABLE. I work with superstars and superheroes — and to most people they seem untouchable, perfect and totally unreliable. People need to know that you’re like them — or that you were like them at one point and now you’ve moved on. People don’t trust experts who sit in their ivory tower! And whether you’ve tried it or not, there is power in vulnerability. Sharing your story, in your own voice – whether in a book or on stage – draws people to you and increases fan loyalty! In the PROMOTE stage, you begin to look for ways to partner with the media to get your mission and message out there. And this is the first stage that you can look for JV partners or others with whom you can collaborate for greater exposure. 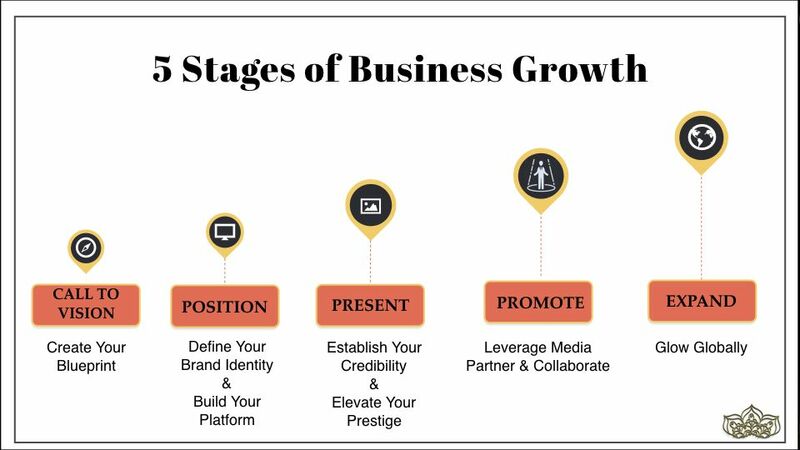 In the EXPAND stage, you aim to ‘Go Global’ to expand your reach and scale your business.